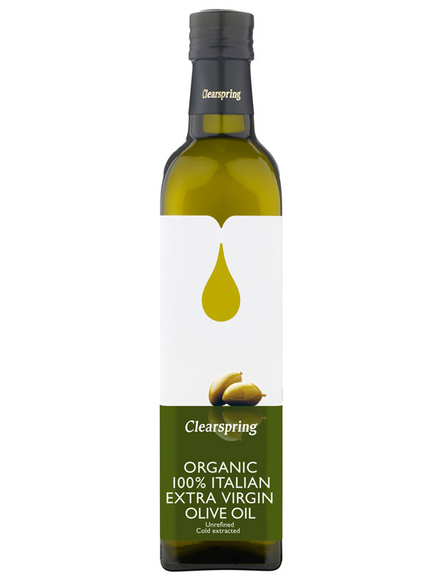 Clearspring Italian Extra Virgin Olive Oil 500g - HealthySupplies.co.uk. Buy Online. Made from fruity Dolce Di Rossano and Coratina olives. First cold pressed without chemicals and carefully filtered. Rich in omega oils and vitamin E.
Ideal for salads, sauces and sauteeing (up to 180°C). This Extra Virgin Olive Oil has been produced using two olive varieties, grown in the warm sunshine of Southern Italy. This blend contains the fruity Dolce Di Rossano olive and the stronger flavoured Coratina olive. The olives are naturally processed without the use of heat of chemicals. First cold pressing means that the oil has been extracted under very low temperatures. Using this method helps to retain the flavour, aroma and colour as well as the nutritional properties and antioxidants. 100% Extra Virgin Organic Olive Oil. Produce of Italy.